Sticking with complimentary colours again, orange and blue this time. Two things changed in this painting, the preparation of the composition and the lack of preparation of the canvas. First, the composition: I did much more preparation for this composition than on previous paintings, taking various photos of the arrangement first and getting them into photoshop so I could easily try different cropping of the arrangement. Kind of like a digital version of my card composition framer. The painting basically consists of two interlocking ‘L’ shapes, one light, one dark, like a geometric yin yang. Squint your eyes so you see less colour and more tonal values and you’ll see what I mean. The light section is slightly larger than the dark, and the orange and cup are part of it. Cropping the cup allowed me to keep a nice line running from the bottom right hand corner, up the fold in the white cloth, round the orange and up into the cup handle, drawing the eye back into the picture. Second, the preparation of the canvas, or lack of it: All the previous paintings have been done over a toned ground of raw umber acrylic wash. This is for two reasons, one because it makes the blank white canvas less intimidating, and two because I believe starting with a mid-toned ground allows you to see the colours you are putting down more accurately. But after the Lemon and Cloth, I had a feeling that the toned ground was not helping me get pure white highlights when I needed them. Just look at how thick I piled on the white paint on the cloth in the lemon picture, that can’t be good. If the painting was done over a few days, I could build up successive layers of highlight and get it pure and opaque, but when working in one sitting (alla prima) or two, as I did here, the paint doesn’t have a chance to dry. So for this one I worked straight onto the white primed canvas. There’s no doubt in my mind that going straight in on the white primed canvas helped me with the highlights on the cloth. Whether it had a real effect on the lightness of the highlights of the cloth, or whether it just helped me to rough out the lights and darks I’m not sure, but either way it made a difference. This time, the very last thing I did was apply pure flake white to the highlights on the cloth, instead of fighting with them right through the painting. Working on a white ground meant that I could simply leave them be till the end and they would read right as I worked on other elements. 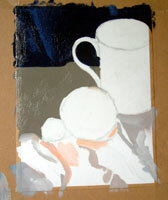 As with the lemon and cloth, I took a few shots during the painting so I could look back at them afterwards. Stage 2, the main objects are in, and I’ve started to define variations in the white cloth in shadow in the background more. I wasn’t far from finishing at this point, but it was half three and the light was going, so rather than rush I decided to finish it the next day. 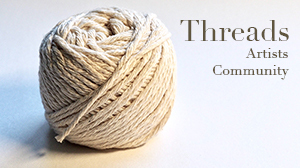 Mainly I didn’t want to rush the cloth since I’ve had such fun and games with white cloth lately. 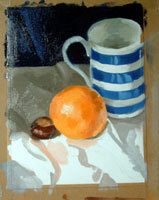 Day 2, and the first thing that struck me on sitting down in front of the painting was that I’d let the tones on the cup get too dark, particularly on the inside and on the blue stripes. Sometimes going away and coming back with fresh eyes lets you see exactly where you’ve got something wrong, even though it looked fine the day before. In the final painting the tones there are lighter, and I gave the greys inside the cup a slightly greenish tint in comparison to the shadows on the back of the cloth. I saw it, trusted my eyes, and this time I was right. One of the main things I wanted to catch was the sheer luminosity of the orange. It fairly shone out of the arrangement, since it was the only one of the objects in full light. I think I got pretty close. I had a lot of problems getting the colour right just with cadmium yellow and alizarin crimson, so I added some cadmium red to the palette. To be honest it didn’t make that much difference. I could get orange hues almost as bright and pure with the crimson. I still wasn’t getting it. Holding the colour checker in front of the orange, then in front of the orange on the painting, I could see I was nowhere near bright enough, I just couldn’t catch that luminescence. In desperation I ran down to the art shop and bought a tube of cadmium orange, cursing myself for copping out on my primaries and black and white only rule. I got back, squirted a nice big blob of orange onto the palette and I was off again. Actually, I don’t think using the cadmium orange made that much difference. 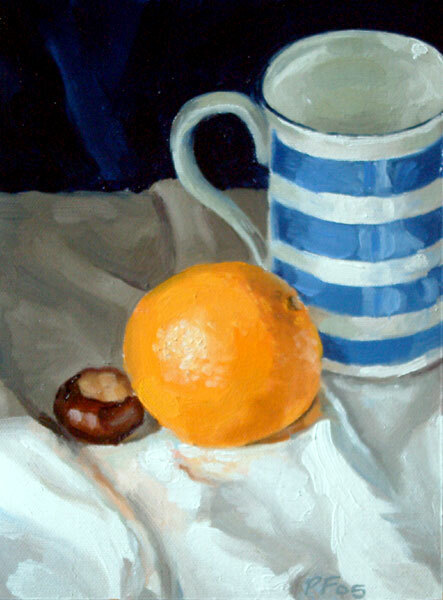 The orange is purer, cleaner, yes, but not strikingly so compared to colours I was mixing, it certainly wasn’t a panacea for my orange problem. I continued anyway. I really think this is another case of oil colour being simply unable to match the hues of nature. In the final painting, the orange shines out very nicely, and it really wasn’t a problem, but I would have been happier if I could have got closer to what I saw. It may be that there are techniques I could have used to intensify the glow (working with successive glazes perhaps), but in these paintings I’m deliberately working quickly and ”bashing them out’. This is because I want to accelerate my development as much as I possibly can. I could happily spend a couple of weeks or more on all of these paintings, but working and reworking the same painting over and over teaches me much less than meeting the fresh challenges posed by a new subject. I’m naturally a very slow, methodical person, so I find it hard to keep up the momentum sometimes, but I know that some time in the future, when I’m satisfied that my ability to paint things as they really are has sufficiently improved, I’ll allow myself to spend longer on each piece and tighten up the drawing, try some other techniques. At the moment working alla prima, or as close as I can reasonably get with only four hours of workable light a day, helps me to develop much quicker. I can almost feel it happening. Even when I fail I learn. Michelle came up to see the picture when it was finished, and wanted to compare it to the carrots and squash. I pulled out the painting from where I’d left it drying, and we were both immediately struck by how dull it looked next to this one. We both remembered it as looking much brighter. I immediately went into a panic, thinking that my paintings were losing their colour and I must be doing something technically wrong. But Michelle pointed out that it may well be that I’m simply getting better. This painting is just brighter, the colours are cleaner. Unfortunately I took the photos of this painting in failing light, so its come out a little dull, I may try to get a better one tomorrow. Its true I’ve changed my technique a bit since the carrots and squash. I use a different brush now for each colour area which helps me to keep the colours much cleaner, and I’m very careful to clean my palette properly at the end of each session so yesterday’s greys don’t dull today’s oranges and yellows. Perhaps that has contributed to the purer, brighter colours I’ve got here. I hope thats the case, time will tell. I feel stronger after this painting, I’ve been deeply disappointed by the last two. My mood is brighter, my confidence is up again, and I can’t wait for the next one. Subscribe: Join over 10,000 other artists and get free updates. I'll also email you THREE FREE value tutorials that will help you bring your pictures to life. Thanks! Now check your email. Your first value exercise is on its way. I'm a (mostly) self-taught artist. I paint realism in oils, mostly still life. I share my work, my evolving process and what knowledge I've gained on my own learning journey here, in the hope that it might help you on yours.